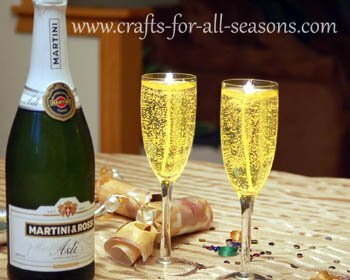 These champagne candles are beautiful and are not hard to make. Do not be intimidated if you have never worked with gel wax before, it is so easy to work with! It is much easier to use than regular wax. The clean up is easy, and the gel has a slow burn time and extra gel can be reused again! 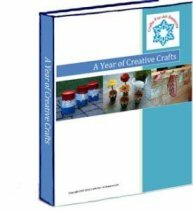 These particular candles are very easy to make if you are just starting out working with gel wax. One tricky thing about using gel wax is trying to eliminate bubbles. However, since these candles represent champagne, we want them to be bubbly! Problem solved! These champagne candles will look stunning as a decoration for New Year's. 1. First wash your champagne flutes and allow to dry completely. 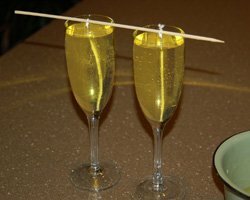 Tie the wicks around a bamboo skewer or pencil and cut to the proper length of the flute, so they just touch the bottom of the glass. 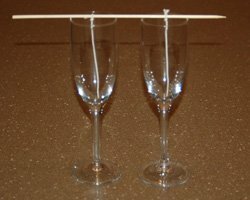 Then balance the bamboo skewer over the glasses, so the wicks hang down the middle. The wick anchor should touch the bottom of the glass. 3. Get your pot ready. Gel wax is very easy to clean up, so you don't have to have a "dedicated" candle cooking pot, although it does help. 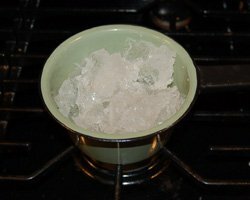 The gel, once cooled, will simply peel off from the inside of the pot. Then the pot can be washed with grease-fighting dish detergent. 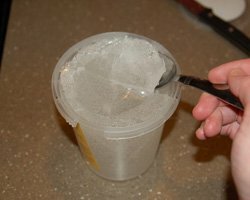 Cut the gel wax with a knife, then use a spoon or your hands to pull out chunks of the wax to put in the pot. Don't be afraid to use our hands. Gel wax is very clean and using your hands is usually the easiest way to get it out! Try to over-estimate rather than under-estimate the amount of wax you need, since any extra is re-usable. 4. Heat the wax over the lowest heat setting on the stove until it begins to melt. Never use a microwave! You can stir the wax to speed up the process. NOTE: Usually when working with gel wax you should NOT stir it, since this introduces bubbles. 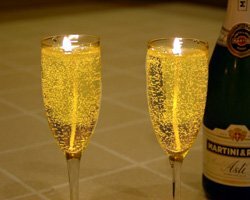 But since we want bubbles in the champagne candles, stirring is fine. Once it is all melted, you are ready to move on to the next step. DO NOT let it sit long after it has melted, as it can get too hot. Follow the manufacturer's instructions exactly. They may suggest using a candy thermometer. Gel wax is highly flammable, so use caution. Never leave the pot and watch it constantly. If it does ignite, do not pour water on it. Instead, extinguish by covering with the lid or use baking soda. 5. 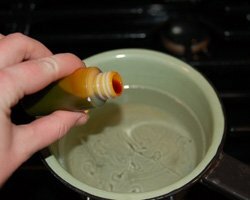 Once the wax is melted, add one tiny drop of yellow coloring. Then stir it into the wax with a spoon. Test the color by spooning up some wax and dropping a small amount on some white paper. If it is too yellow for your liking, add in some more wax to dilute the color. If you would like to add a scent, this is the time to do that too.y. 6. Pour the wax carefully into the prepared flutes. 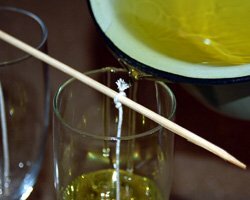 Use a bamboo skewer to carefully stir up the wax once it is poured in the flutes. This will help bubbles to form. You may not see many bubbles while the wax is hot (as you can see in the photo below right). Don't worry, when you check on them in several hours there will be bubbles that appeared. Let the champagne candles sit undisturbed for several hours until set. 7. Once the champagne candles are set, just trim the wicks to 1/4 inch or so and they are ready to burn. 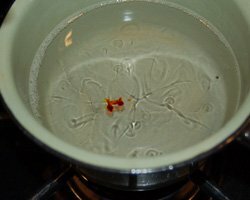 For clean-up, just rinse the pot immediately with some cool water and the gel will solidify and you can peel it off and save for later use. Then just let the pot soak with some warm water and dish detergent to remove any left-over residue, and scrub off with a sponge.